You are here: Home / Paw Tales / The best companion…truly said! I always wanted to have a pet dog. But did not want to take the responsibility. 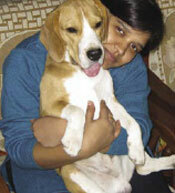 We shifted to Gurgaon and we had two dogs on our floor – one Labrador and one Russian Poodle. The first look of the Labrador frightened me, but to my surprise, he was very friendly. We started calling him home, talking to him, playing with him, etc. 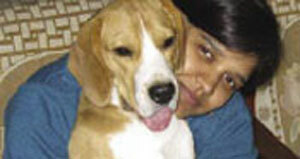 Someone rightly said, ‘dog is a child who never grows up’. My confidence to parent a dog increased. We did a lot of research on which breed would be the best for us. We narrowed down our search and decided on having a small breed. We chose a beagle. I had to wait for 24 hours before I got the pup home. Those 24 hours were so thrilling for me. My dream came true when we brought home ‘our baby’ who was just 4.5 inch long and two-inch high. Awwwwwww! Was my first reaction! My husband came to the shop, looked at the small little being and said, “This is it!! !” I still remember the smile on his face which conveyed ‘how can something be so small’. We got him home around 7 pm on the same day. The first few months really took a toll on me, understanding the little new member in my family, and running all around him to teach him things, play with him, train him, etc. My sister asked me to name him Bruno but he liked ‘Bruno Baby’ better and so he is called ‘Bruno Baby’ now. Today, he understands whatever I say, interprets whatever I do, comprehends whatever I convey and expresses what he wants in his own innovative ways. The one thing I would always wonder is ‘how a being who cannot speak, can actually speak so much!! !’ Given a chance, some day I would love to do a research on ‘how dogs think…rather how Beagles think’ out of mere curiosity. I have his photograph framed on my table, and I smile whenever I see that photograph when I am away from him. Thank you Bruno Baby for coming into our lives and making it special! http://www.dogsandpupsmagazine.com/wp-content/uploads/2011/01/The-best-companion...truly-said-2.jpg 159 300 Dogs and pups Magazine http://www.dogsandpupsmagazine.com/wp-content/uploads/2017/05/1254nal.jpg Dogs and pups Magazine2011-01-14 00:00:002013-09-06 15:27:08The best companion...truly said!